Word of the Day – "weise" | German is easy! It’s probably not a surprise that weise is the German version of wise. What might be more of a reveal is that the two are related to one of the German verbs for to know: wissen. And there is wissen’s brother weisen (and its zoo of uber useful prefix versions) which is basically the “causal” brother of wissen and originally meant “to make know”. And now what is the most bestest way to make people know something?! And that’s precisely what I have prepared for you about the weise-family. Are you ready for 176 slides full of boredom and bad layout about the family of weise?!?! Perfect, let’s jump right in then with slide 1…. Of course Power Point is NOT the best way to make someone know something. And the cool thing is that weisen and wissen have a LOT to do with looking. Because… drum roll please… they actually come the Indo-European root *weid , which meant to see and which brought us words like vision, evident or visible. It’s kind of funny to look at visible with the German wissen in mind… like… “wissable”…. if you can see it you can know it. From seeing to knowing it’s really not that far. Ich weise dir den Weg. I show/guide you the way. The hikers are waiting under the signpost for a change of weather. You can think of it as “showing the way” or “making know the way” – it’s really kind of the same thing. This connection, this blend of showing and informing, is the core of weisen. And it’s of course also the key to the prefix versions of weisen which are also known as Must Have Brothers. And no, I don’t mean these two. Seriously… weisen itself is not that useful but the prefix versions are the bomb. The range of meanings is super crazy and reacher from reject to wire transfer to turn out. But with the core idea of showing-informing in mind, it’s obvious that they’re all cut from the same cloth. Actually, let’s do a little try. I’ll give you the examples and you see, if the meanings make sense to you, okay? Spanien hat den Nordkoreanischen Botschafter ausgewiesen. Spain has expelled the ambassador of North Korea. Der Ausweis is based on the idea of “informing the outside (world)” and the second example is more about literally showing someone out. This one is only used in rather formal contexts though. Wir möchten Sie auch auf unseren Speisewagen hinweisen, wo sie Kaffee, Bier und manschiges Essen zu lächerlich hohen Preisen bekommen können. We’d also like to point you to/direct your attention to our dining cart where you can get coffee, beer and mushy food to ridiculously high prices. Kannst du mir einen Hinweis geben? Meine neue Jacke ist wasserabweisend. My new jacket is water repellent. Das Wasser ist sehr traurig, weil meine Jacke es abgewiesen hat. The water is very sad, because my jacket rejected it. Bitte überweisen Sie den Betrag innerhalb von 2 Wochen auf das unten genannte Konto. Please wire-transfer the amount within two weeks to the account stated below. Mein Hausarzt gibt mir eine Überweisung zum Chiropraktiker. My physician gives me a referral for the chiropractor. I hope you can see that they all have this weird mixture of pointing and informing, just with different general “directions”. Hinweisen points you to a piece of new information, abweisen points you away, tells you no and überweisen is in essence about sending from A to B, only that it’s limited to two niches. Ready for round 3? The toughest one? Einhörner existieren solange bis das Gegenteil bewiesen ist. Unicorns exist until the opposite is proven. Der Regenschirm hat sich als sehr nützlich erwiesen. The umbrella turned out very useful. Anjelika hat die Katze des Bettes verwiesen. Anjelika banned the cat from the bed. As usual, these prefixes play hard to get, so don’t worry if you couldn’t really make sense of those. Beweisen is basically an intense version of making known. Proving something is making it known for real. No doubt left. Erweisen is based on er- in its very old sense of outward. Something shows itself out. And as for verweisen, that’s a classic away-ver. Now, having gone through these examples, I think you know why I called the weisen-prefix versions the Must Have Brothers :). And those weren’t even all of them. There’s also aufweisen (idea of feature, have) and anweisen (idea of order and instruction) and einweisen (idea of introduction) and unterweisen (a sort of teaching) and more. But I’m actually quite sure that, with the core idea of showing and informing in mind, you can understand all of them from context and if not, we can talk about it in the comments. So instead of looking at more examples, let’s turn the spotlight back to weise. I mean… it’s in the title, so there must be something more than just pure wisdom. Tssss…. wisdom… so boring. So yeah, weise means wise and when we remember that they’re both connected to wissen, we see that they basically just mean “knowing”. The new intern is not exactly the smartest kid on the block. Relationship-wise, unicorn-wise, food-wise … it works pretty much with any noun. Problem is: this does NOT work in German, even though the German -weise is also an ending and there are loads of super common words with it like beziehungsw... uh… like… komischerweise. And yet, it would confuse the hell out of a German speaker if you were to translate food-wise as essensweise. Why? Because Essensweise would be understood as way of eating. You see… German has the noun die Weise which means way, manner. Die Weise is by far not as common as die Art, which also means manner, but there are a few common phrasings with that you’ll definitely come across. The way of working/method of the yoga teacher is very flexible. Get it, get it… yoga… flexible … uh… yeah, that’s all I have to offer joke-wise. Which brings us back to the English wise-ending. This idea of manner, way that we see in German Weise, is the actual core of it. And we can see it in older words like stepwise (“in a step manner”) , likewise (“in a manner of the likeness”) or clockwise (“in the manner of the clock”). The notion of “as far as noun is concerned” is shift in meaning, and that shift just never happened in German. That’s why Essensweise does NOT mean food-wise. The German -weise has kept the older sense of “in a manner of” and German has haufenweise (loads of) useful, super common words with it. Mein Wecker hat gestern versagt. Glücklicherweise musste ich auf Klo, sonst wäre ich voll zu spät gekommen. Yesterday, my alarm failed. Luckily I had to go to the toilet, otherwise I would have been late big time. Bedauerlicherweise müssen wir Ihnen mitteilen, dass sich die Lieferung verzögern kann. Unfortunately (lit: in a regretting manner) we have to inform you that the delivery might be delayed. In dem Wald waren haufenweise Einhörner. In the forest, there were loads of unicorns. Those are really but a few examples and it was really hard to pick some because there are so many common ones. If you want, we can talk about more of them in the comments. As you can see English wise-words don’t really show up as a translation. So.. weise and wise are not really false friends, but when it comes to the endings, it’s better not to try direct translation because they will rarely work. Cool. And I think that’s it for today. This was our look at the weis-words and we’ve covered absolutely everything there is to say abou th… oh, hold on, see we have a call here, Bisimwa from Kongo, welcome to the show. Uh… I don’t know why you’d have an elephant in your room. Do you have a really big door?! Wait, what…. Why are there two callers now… who are you? Crap… there must be something wrong with my phone system…. Hello… hello… a phew, It stopped. That never happened before How did so many people end up in my hea… I mean the phone system at the same time. But seriously, I know many of you are confused by beziehungsweise is a -weise word but I just feel like cramming it in here would be too much. We’ll talk about it some other time. So yeah, that’s it for today. This was our look at weise and the verb weisen and even though they don’t usually come to mind as part of the most important words, you will be surprised how frequent you’ll come across weisen-versions or words with weise as an ending. If you have questions about any of this or if you want to talk about a particular word that we didn’t mention, just leave me a comment. This entry was posted in Adjectives, Audio Examples, B-Level, Broad Vocabulary, Must have words, Vocabulary. Bookmark the permalink. Danke dir, dass du uns eine Kastanie bzw. Rosskastanie gewiesen hast! 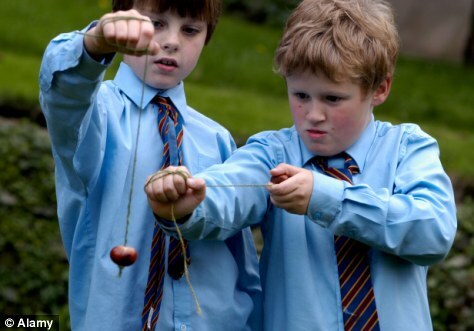 In England nennen wir sie “conkers”, womit Jungen früher ein Spiel gespielt haben. 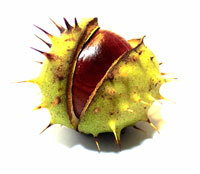 Sie wurden auf einen Schnürsenkel aufgezogen und dann zwei Jungen wurden sich abwechseln, die andere “conker” zu zerschlagen. Geliebte Gedächtnisse! Oh, ein paar Korrekturen :). “weisen” hat die Idee von “showing” aber in diesem Kontext funktioniert es nicht mehr. Nur noch für “directions”, aber nicht mehr für Dinge. Für die Kastanie sagt man “zeigen”. Und dann… “das Gedächtnis” ist der Speicher,”die Erinnerung” sind die Daten. Beides ist “memory” auf Englisch. In diesem Kontext brauchst du “geliebte Erinnerungen”. Das Britischste Bild, das man je gesehen hat. Okay, so this is super weird but last night I had a barrage of crazy dream sequences and one of them was as follows. What is wrong with me XD?? This grey foot long mantle thing. I’m guessing you mean ankle/foot length or something because if it’s only a foot long we will be seeing more of Theresa than we really want to! Mrs May really should try something like this though. I, for one, would think far more highly of her were she willing to embrace such madcap antics. As for what it says about you Emanuel, you are clearly a well adjusted man-about-town with maybe a tendency to eat cheese before bedtime. Unverständlicherweise habe ich anonym kommentiert. Toller Artikel Emanuel! Wenn du meinst “favorites” dann “einer meiner beliebtesten”. “beliebt” allein is einfach nur “liked”. Aber ey, nix “in over your head”… you totally owned that sentence! Was für einen tollen Artikel! Danke. Ich weiß nicht, wie es möglich ist, dass ich über dieses Wort nie gehört habe! So viele nützliche Wörter mit “-weise” und ich kenne keine… Eine richtige Peinlichkeit. Wie würde man sagen die Englishe “-wise” in Deutsch? Soll man “von-her” nutzen? Und ist das gut auch für schriftliche/officielle Komunikation, oder ist es nur umgangssprächlich? Zb. Food-wise, that was a good restaurant. =(?) Von dem Essen her, war das Reastaurant gut. Ja, “von… her…” ist eine Option, aber es ist, wie du sagst, umgangssprachlich. Es kann leicht ein bisschen dumm klingen. “Was X angeht… ” ist eine weitere Option, und die klingt ein bisschen gehobener. – Vom Essen her war das Restaurant gut. – Was das Essen angeht, war das Restaurant gut. Und dann gibt’s noch “bezüglich des X”, aber das ist dann schon sehr formal. Einfach der Hammer was du immer schreibst. Deshalb habe ich endlich entschieden zu abonnieren.. ich bin manchmal zu sparsam, aber ich gönne mir ein Onlinegeschenk. Lieber Brainfood als Nosecandy hat Mama immer gesagt. Nicht untersagt ist auch ein Bier dazu. Möglicherweise denke ich zu viel darüber nach, aber warum hast du “Bedauerlicherweise” als “Unfortunately” übersetzt? Könnte man hier “regrettably” verwenden? In German I am not very familiar with the subtleties of remorse. The longer I remain in Berlin, the more I believe that will change. Es dünkt mich, du kannst es ganz sicher aufklären. ich stehe ziemlich unsicher zwischen Mutti (Englisch) und Freundin (Teutsch), und ich habe Angst, dass ich keine Sprache richtig gut nachvollziehen kann. Wow, erst mal ein großes Kompliment für dein Deutsch!! Du klingst fast wie ein Muttersprachler!! Was ist dein Geheimnis? Wie lange hast du dafür gelernt? Zu deiner Frage: ja, “regrettably” is auch ein Option. Vielleicht /wahrscheinlich ist sie sogar besser, aber dafür ist mein Sprachgefühl in Englisch nicht gut genug. “Bedauerlicherweise” ist für mich einfach ein formaler, gestelzter klingendes Synonym für “leider” und “unfortunately” war das erste, was mir eingefallen ist. “sadly” wäre ein bisschen kurz, aber “unfortunately” ist (für meine Wahrnehmung) kompliziert genug um “bedauerlicherweise” gerecht zu werden. Wie ist denn für dich der Unterschied zwischen “unfortunately” und regrettably”? Was dein Bier angeht… guck mal im Kühlschrank ;). – “Anjelika hat die Katze des Bettes verwiesen.” – why do you use Genitive here? – “Warum ist ein Scheiß-Zebra in der unserer Küche?” – here is one der or unserer too much, or? – Warum Genitiv? Why not :)? Seriously though, that’s just the case “verweisen” demands. The person “banned” is in Accusative and the forbidden place is in Genitive. – Yes, the “der” is too much. Typical editing typo. Vielen Dank fürs finden!! Solche Fehler sind sehr verwirrend für die Leute (shame on me). I’m the original poster, but for me “unfortunately” sounds a lot less fancier than “regrettably”. Also, “unfortunately” carries a notion of “outer force” – that the bad thing that happened was caused by something general and imprecisely defined. “Regrettably” on the other hand sounds like something could be changed about the situation, but it is too late now. Also, it is maybe more personal, meaning that the bad thing affects me in some special bad way. It started to rain when I was out and regrettably I had not taken my umbrella with me, so I was wet when I came home. Hmmm… based on that I’d actually say that “unfortunately” is the better fit. Not based on meaning, though. “bedauern” does, at often, imply some form of regret (doesn’t have to). But “bedauerlicherweise” sounds detached and sterile and I can’t hear any real regret in it. “leider” would be more “from the heart”. “I’m afraid [that]…” is probably a closer fit for “leider,” at least in terms of tone and register. How about if the event is in the past and there’s no doubt. What’s the best fit then? – Ich hab leider mein Handy verloren. Would you still use “I’m afraid” even though it technically makes no sense? Normalerweise schreibe ich nicht in die Kommentare… aber diesmal ausnahmsweise tue ich das. Hier mein Versuch. “aufweisen”, “anweisen”, “einweisen”,& “unterweisen” im Satz zu formulieren. Um in der Hölle arbeiten zu können, muss man besondere Fähigkeiten zum Quälen aufweisen. Heute wurde uns Trigonometrie unterwiesen. 1) Absolut perfekt!!! Flawless victory. 3) Satz a is perfekt. In Satz b) stimmt “in die Straßeseite” nicht. Die Präposition wäre wohl “auf”aber irgendwie klingt das Beispiel nicht idiomatisch für mich. “einweisen” ist zu “drin” für einfach nur eine Seite. – Heute wurden wir in Trigonometrie unterwiesen. Der der lernt wird “im Thema” unterwiesen. Der Satz klingt aber extrem formal und “unterweisen” wird nicht oft im Kontext von solchem Lernen verwendet sondern eher für Regeln. Aber ja… wow, echt beeindruckend. Seit wann lernst du schon Deutsch? Yay, danke! Ich glaube mein Deutsch ist immer noch echt schlimm. Uch kann noch nicht mal einen komplizierteren (was für ein Wort.. gibt’s das überhaupt) Satz schreiben, ohne im Duden nachzuschlagen. Manchmal brauche ich zu viel Zeit, bis mir ein Wort einfällt. Hast du irgendwelche Tipps dagegen? Wie sagt man also “to direct vehicles towards the street side”? Entschuldige für mein schlechtes Englisch.. bin kein Muttersprachler.